In her first post, Students Drive Their Learning: What Is A Mastery Based Learning System, 4th grade math teacher, Molly Nealeigh shared why she began to use a mastery based system, and explained what it is and how it supports students to work at any level, any time, anywhere. 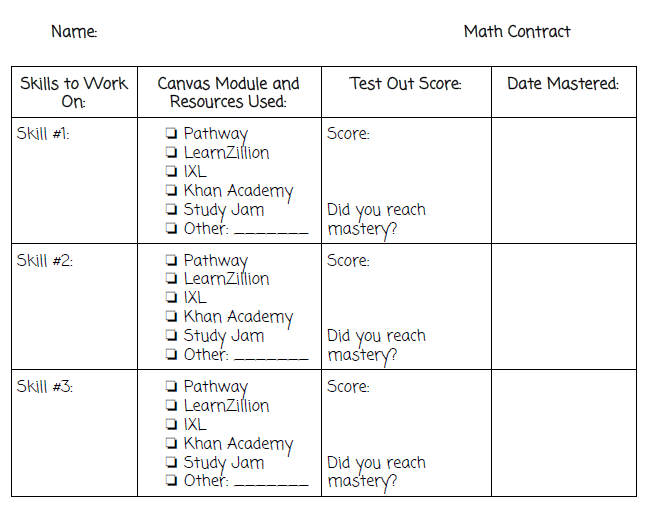 In her second post, Molly breaks down essential elements in a Mastery Based Learning System including Data Analysis and Reflection, Learning Profile with MasteryConnect, Error Analysis Booklets, and the Math Contract. Each element is an important component of the system she built alongside her BetterLesson coach, Romain Bertrand, to make this shift in her instructional approach. Students analyze their data immediately after taking an assessment. 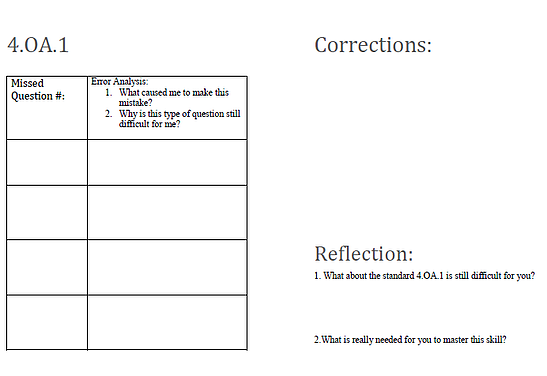 For each assessment, I create a chart broken down by standard and the questions that go with that standard. 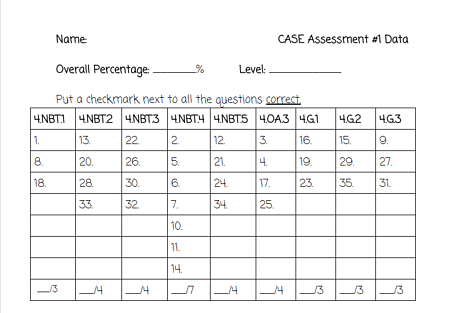 Since I use Mastery Connect, it makes it easy for students to look at their correct/incorrect answers and fill out the chart. At first, it takes a lot of explaining to students how to correctly mark the spaces and what the data means. I help students calculate a percentage for each standard and then we talk about mastery levels. In my class, we set mastery (green) at 80-100%, near mastery (yellow) at 60-79%, and needs support (red) at 59% or lower. Students are able to share through reflection what they did well on and what they have not mastered yet. SECRET #1: Do this within 48 hours of taking an assessment. Also, let students color skills green, yellow, or red with a crayon. OR even better, have them do it electronically and highlight them on Google Drive. It will help them visualize it better! 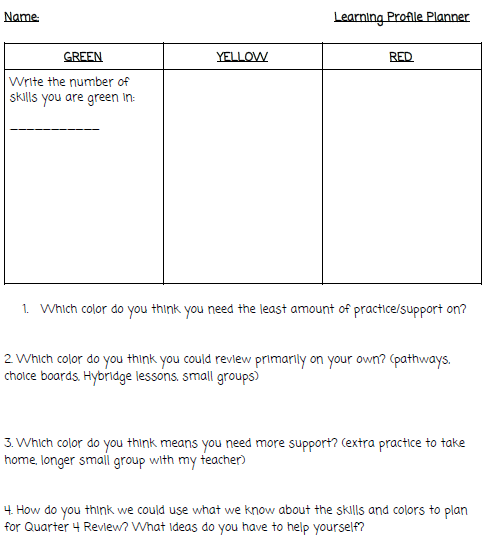 Students examine their standards on the progress page of their MasteryConnect profile and categorize skills based on mastery, near mastery, or needs support. We have a discussion around near mastery and needs support skills. This is important because when students end up creating or choosing their pathways, they will need to understand that it will be easier for them to flip their near mastery skills to mastery than it would be for the needs support skills. The needs support skills should be saved for intervention time and/or small group time. The near mastery skills will become skills they work on independently through pathways and Canvas Modules. Secret #2: Don’t spend too much time on this step. The most important point is making sure students know that red skills require more support from a teacher or assistant and the yellow skills mean they can be more independent. This is where things get really exciting! The booklets give students the chance to dive deep into the why they missed a question. 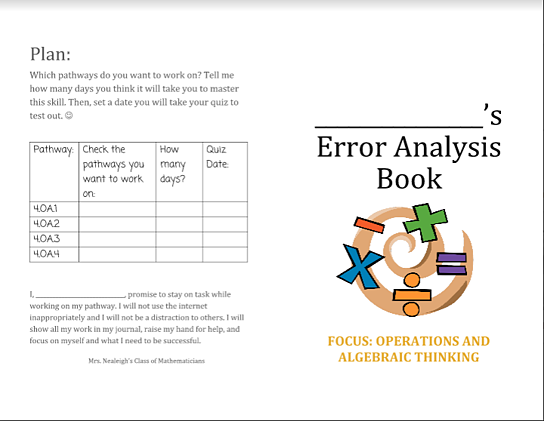 This booklet sorts errors based on either “careless mistakes” or “I don’t understand this at all.” For my students, it made them feel more at ease when they were given to the option to explain what happened and make the test correction right away, rather than making it out to be something they can’t do at all. This also helps the teacher because you want to use your time helping students fix mistakes they need remediation in. The booklets take some time. But I got some of my most personal, reflective student explanations through them that helped me understand my students way more than if I had not asked them. Even in fourth grade, students were able to pinpoint exactly what they their error was and this made workshop time more valuable for us all. SECRET #3: The first time I did this, I underestimated how long it would take students to complete this. So, the next time I did, I chunked it and had them first look at the power standards and then the standards they missed the most in. The example below is one variation. 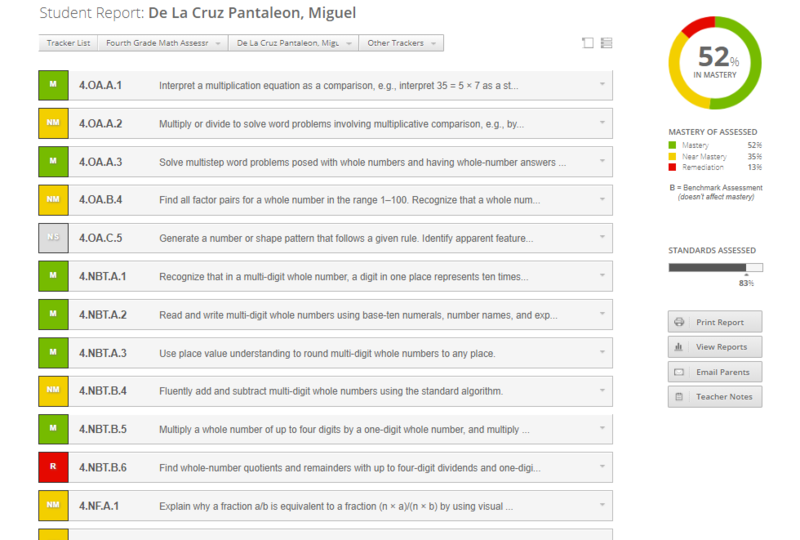 There are a lot of different ways you can set up a math contract! For my class, we update the contracts each week. Students turn in their contracts on Fridays and create new ones first thing Monday. This does not take more than five minutes. Students use their data to choose the near mastery (yellow) skills they need to work on. They choose up to three skills and that is what they work on independently during workshop time. Students assign themselves pathways and are given codes for the test out quizzes on MasteryConnect. Students complete their math contract at their own pace. Sometimes a conversation is needed because students won’t always be great time managers. So, at the beginning, I try to have them complete two skills by Friday and give them completion points in the gradebook. Secret #4: Copy these on cardstock. Students tend to rip and crinkle them, unfortunately. Molly Nealeigh is a 4th Grade Math Teacher at Piney Grove Elementary, Charlotte Mecklenburg Schools, NC.